The Freeze Concentration (FC) technology aims at solely removing water, in the form of ice, from a given stream in order to reduce its volume, produce a high quality concentrated solution or recover clean water for reuse in an industrial process. The basic principle of Freeze Concentration is the simple fact that the structure of an ice crystal does not leave space to include impurities (salts). The growing ice crystals will reject the existing dissolved salts in a solution. When an aqueous solution with low TDS values (the dissolved salts are in small concentrations, lower than their eutectic concentration) is cooled down, the first crystallizing component will be ice. By operating at temperatures and concentrations just prior to reaching the eutectic point of a certain solution, ice will remain the only crystallizing component while all other dissolved components will stay in the solution. 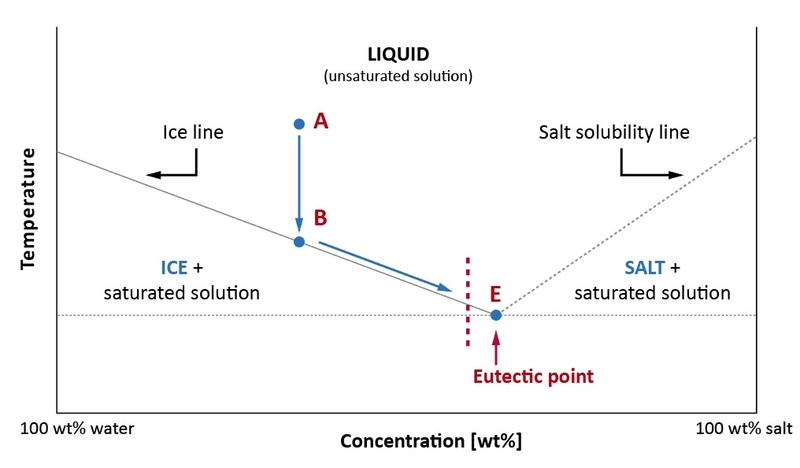 The composition of the stream meant for concentrating with FC will give the optimum operating temperature of such a system as different salts have different eutectic temperatures and concentrations.